Early on, Steven struggled. After starting a blog, he just couldn’t seem to get the traffic or engagement he wanted. You know I’ve already lost hope on facebook page since its decrease on post reach. But as thou said, will try out your shared technique – hope it works for me. Marsha this is a very meaty article not only about Facebook page but also on how to approach writing in general. “How can you help others through your post?” is a very important thing to consider. Writing to serve your audience instead of yourself is a great reminder. I’m bookmarking this to include on my collection of posts that I need to reread. So glad you enjoyed Marsha’s article and you got something from it. You have shared exellent way for facebook likes. i am really feeling good to learn from here. Thanks Yasir. Glad you are learning from them! Great piece Marsha. I have been toying with the thought of doing Facebook live talks. Just not been brave enough to take the plunge yet. But it’s definitely in the pipeline. Hi Adewale. Don’t think about it, I would just go ahead and hit that live button just to get your first one out of the way. It’s the first one that’s the hardest, once you do your 1st one you’ll see how easy it is and realise it’s really easy and enjoyable. Steven’s work is living proof of that message. While I agree with most of the part, I’m having hard time imagining if it works for all niches. For e.g. if someone’s in online money making niche, it’d be difficult to write content which “touches hearts of the people”. Similarly, this soul shaking content takes time to create. So I find it difficult to keep your FB page active. And the advice that I’ve read of many “facebook gurus” is that you got to post frequently on your Facebook page. So how can one tackle this situation? BTW, you never mentioned what frequency of posting does Aitchison suggests? Or does it matter at all. I like the part where Aitchison creates his own quotes and puts his name underneath. However, wouldn’t you be considered arrogant when doing so? These are some of the questions that came in my mind while going through this article. However, as always, it was quite informational with valuable insights. I’m myself struggling to get active fans for my FB page so I guess I can put some of the techniques to use. Great questions. Thanks for taking the time. None of this is actually that difficult. Steven teaches these techniques to the students in his course, most of whom are in online money-making niches. If you think about it, your potential customers have a problem and are searching for a solution. So showing them you can solve their problem for them does “touch their heart” because it gives them relief. It comes down to knowing your customers so well that you can dial in their frustrations and fears around their problems — the core of your marketing. It does take time to create good content, no doubt. 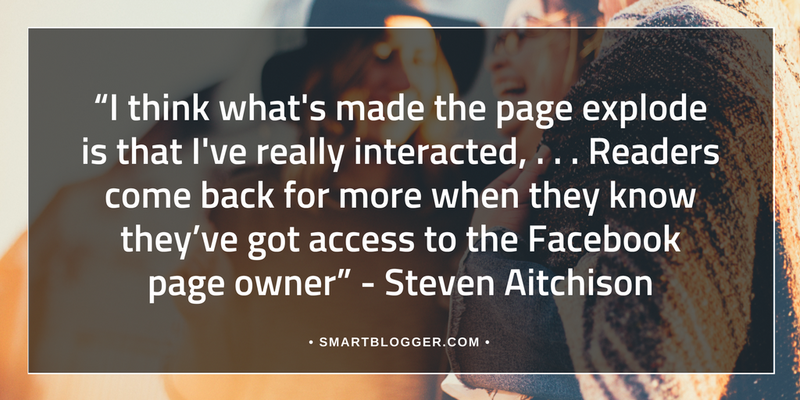 But once you know what your readers respond to, as Steven says, you rinse and repeat to a certain extent. You’re not recreating the wheel every time, but giving people what they want and respond to once you recognize the pattern. Steven does post frequently — I think somewhere around 4 -6 times a day. He’s adjusted the frequency over time as he’s studied his stats. It does matter because as the post explains, Facebook doesn’t automatically show all your content to all your followers, so you want to make sure you have enough posts going into the pipeline. I suppose you could consider claiming your insights as being arrogant, but why give someone else the credit? And why wait for someone to, maybe, give you the credit? I consider it being willing to plant your flag and state what you stand for. I hope you give these steps a try. Thanks for your questions, really appreciate you taking the time. Let me ask you a question – Is it arrogant for someone to write a book and put their name to it or is it arrogant for someone to write a blog post and put their name to it? Think of writing quotes as smaller versions of a blog post or a book. The power of a quote should never be underestimated and can literally change someone’s life. I remember when I first read this quote from Martha Beck “The way you do anything is the way you do everything” – That quote changed the way I thought about doing the small things in my life in both my business and my personal life. When you can write little nuggets of gold like that, you could literally change someone’s life, so why not share it with the world. Thanks for taking time and responding to my comment. Yup. I’d definitely give your ideas a try. Excellent tips for facebook page growth. I have noted a new thing today that facebook does not show your posts to all your fans but tests it first with 6% fans. This is true and I have observed this on my facebook page. Thanks Vijay. Glad you have new insight into Facebook! Facebook I think is an ideal place to market your blog or website. However, you should consider sharing content on numerous social networks after publishing new content. Love it! Thanks Marsha for an amazing write up. I particularly loved the 8 Steps to Attracting Millions of Fans. And thanks to Steven for being so open and sharing this gold with us. Thanks Miranda. Go forth and conquer! Thank you Miranda, so glad you enjoyed this. I got confused with uploading pictures on facebook page. Should i use Name related pictures on my page or i can post anything? I really appreciate these suggestions, Steven. Thanks. This is an excellent article! Blog, FB and Email list are like Avengers! All good things are possible to those who believe and do the transformation business work. Thank-you for posting such an informative and inspirational article. My biggest take-away: “Know Your Audience Better Than You Know Yourself” – but this is not easy. Yes even with all the data Facebook provides (at least for me). Some of of you guys are adept marketers, when I say that I mean you’re naturally good at it. I am learning – thank you again guys!! We all started from knowing nothing, Debojit. Look at Steven — he lost $50K on Facebook ads before he learned. That’s an expensive education! The best advice i can give here is not to think about the stats too much just now and decide what you want to give to the world and then just go out and give. Be yourself in your writing, your live shows, and your posts and your tribe will start to find you. Then start looking at your numbers and find more of your tribe. As you do this you will become a much more confident person. Great article and case study. I have been getting more traffic through me facebook group than page. I guess for few niche facebook closed group is good as you can encourage others to share their thoughts and have a good discussion. facebook page is page is great for some others,I mean you cant handle a facebook group of 1 million people right. Megan, FB pages and groups have different functions. Once people have gotten to know you through your FB page, the next step is to invite them to a group, which provides more engagement. It can be the next step in your marketing funnel. Great point. Groups are an amazing way to build your audience as well. they should go hand in hand. really an eyeopener post….from today I will start thinking the same way and will thinks of helping people than making money…great inspirational article…keep it up..! So glad you enjoyed this Arvind. Jon has always been one of the most influential bloggers in the whole world. With his new blog, he changed everything. And when it comes to Steven and the things mention in this post, it’s really important to think “how to help people?”. That’s the basic thing to build your personal brand. Making money from Facebook requires money for sure. Ignoring the fact that other pages are also doing great is a mistake. 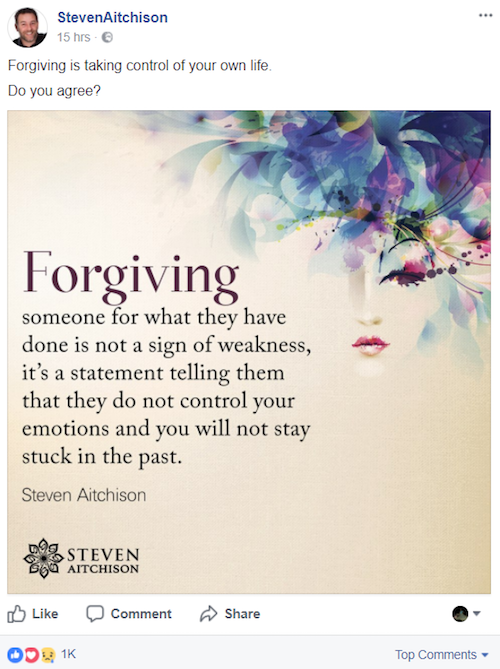 I liked the way you have added Steven’s posts about sharing other’s posts. The video content always attracts. Though the Facebook predictions can’t be done by everyone. Only experts can understand their move. Thanks Ravi. Glad you enjoyed it. 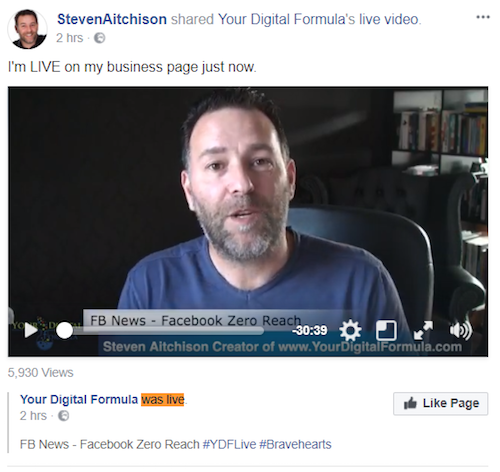 Although facebook are more and more becoming a ‘pay to play’ platform, you can still build a huge following and make a lot of money from your Facebook page without buying ads. So glad you enjoyed Marsha’s article. Delighted to read this post. 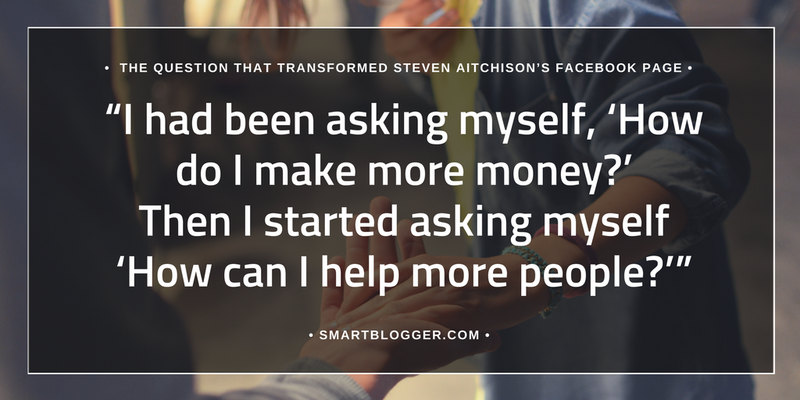 Steve Aitchison is the real deal: a truly authentic guy – yet he’s also wise in the ways of the internet to the extent that not only has he become successful but he’s also helped many others experience success too. A win-win situation. A big shout also out for Jon’s own work: love it! Thank you so much Keith for your support, I so appreciate you. Wow! This is really encouraging for someone starting over with a new Facebook page, and who is tired of the “standard” marketing tactics and tricks. It’s refreshing to see an emphasis on care and authenticity is rewarded. Looking forward to putting this strategy into practice. Honestly, if you can get into the mindset of asking ‘What do my readers want’ you won’t go far wrong. Yes you may still have to advertise to grow your page quicker, but it’s not completely necessary. Advertising only accelerates your progress. Adding FB Page like button to WP blog can also increase likes when done smartly. This is a wonderful article. Too motivational and inspiring. Loved the part about connecting with the audience. Above all factors, that is very important. Interacting with the followers imbibes confidence in them. Also, it provides credibility to our page and posts. Facebook Live has helped us achieve this connection. Cheers to you Steven for being a wonderful human. Thank you for this informative and motivation article. 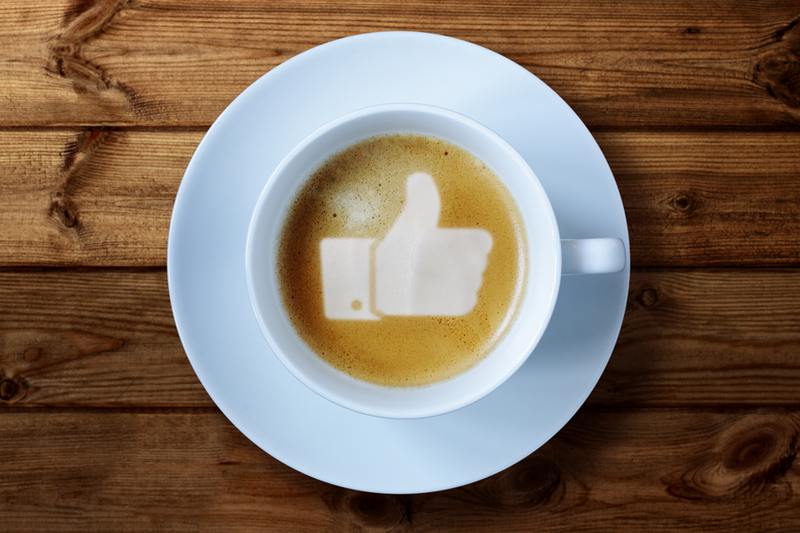 You nice explained some serious tricks about to make a great business on facebook. Increasing fans of FB Page is quite important as an Email Marketing as. Wow Steven, your success record inspires me. I’m definitely going to give this a shut. Video is trending hard now. I also noticed Facebook is pushing their audience network really hard but not much money is made from there. I have long ago stopped tasking my fans to buy and buy. Thanks. Marsha, you did an awesome work here. This is a great article in so many ways. Several things come up. First off, I would like to interview you on our podcast which is called, “The Thought Hackers.” Our main focus is working with people who have come from a place of trauma to where they have not only survived, they are thriving – and they have a message to share. In every case, there was at least one major turning point which allowed them to live the lives they have today. We also interview experts on the forefront of mind development. I think you will enjoy what we do. The second part, assuming you’re open to it is being a guest on your podcast. There are two of us I’m suggesting for that. Myself, since I’ve recovered from PTSD and I have some valuable information to share with your audience. And the second reason is I think you would enjoy interviewing my coach, Hamish Bayston, the man who freed me from my PTSD. The no#1 point is the core of everything else. Whatever you do whether it’s online or offline, your main focus should be to help your audience. If someone only focuses on helping others, then a magic can happen for sure. And, the magic will not only attract fans from FB, but also entice them from any platform. 1.Shift your focus from helping people to making money. 2. Know yourself better than you know your audience. My point: I hope It comes natural to people to ALSO behave on the internet and show their personal – human – side. That being side, it is always nice to see people carrying out this simple approach with success. The fact that you need to be honest and personal in your writing is a consequence of the vast amount of material out there today. Many people receive a huge amount of mail, newsletters, notifications etc. daily, and I think most of them actually want to read it all – only they don’t have the time. So they automatically direct their attention to content that is real and personal because they can relate to it. It’s what gives them inspiration in their everday lives. I think the demand for personal and emotional writing is increasing and it goes for almost all types of online content. Good for you Steven – and thank you for setting an example. Really super post, guys! There’s a lot of meat here. I paid a lot of money on facebook fan page to get audience. Its unfortunate its no longer converting. I wished to had gotten this tips so I won’t spend. well-researched, thought and inspiration provoking! Loaded with great info. I’m in the process of taking a different approach to my coaching, and this is a perfect resource to save. Thank you for the perfection! Marsha, thanks for sharing this case study: it’s very interesting – especially considering that Facebook ads are getting more and more expensive – thus getting organic reach is a more valuable skill. Among all the tips, I think step #7 is the most brilliant. I know quite a few people who got huge exposure just because they started using Facebook live at the right time. And of course, congratulations to Steven for his massive success! Wow! Excellent Article. Learned a lot from this post. This is very helpful for me. Thank you for this post. Excelent article i am going to use these for my website. Learned a lot!!!!!!! Wow – there’s some great food for thought here. Great article! I am doing same strategy but not good results as you have mentioned. Really happy I came upon this. What you are doing is not only genius from a marketing stand point, but you really care for the people you are helping. I think we need more people like Steven in this world. Loved the article and tips shared here. I have one question, though. I was looking at Steven’s Facebook page and notice that he posts a few post every hour or so. Wouldn’t that be considered “spammy” by followers? I know for a fact that I would find myself reaching for the Unfollow button if I kept getting so many posts throughout the day from a single page. Or is this just my (erroneous) perception and it is actually a good practice to post many times a day on a Facebook page? Good question. As we talked about in Step #6, only a small percentage of your Facebook followers are shown a post when you first post it – maybe around 6%. More people are shown the post if it gains in popularity. The takeaway is that 100% of your followers NEVER see 100% of your posts, so you really don’t have to worry about spamming your followers. Hope that helps. Thanks for the quick response, Marsha. If it’s not too greedy of me, let me ask another related question just to make sure I’m not mistaken in my beliefs on how the Facebook algorithm works. If I have 100 followers and share something only 6% or so of those followers will see it. Let’s say out of those 6 who get exposed to the content, only 4 will engage (like or comment). Next time I post something, aren’t there higher chances that those 6 and mostly those 4 who did engage, will see the newly shared post over those didn’t even get to see the former post? This would cause further discomfort in those who do engage with my content as they will be inundated with my shares. My understanding is that Facebook shows the post to more people but doesn’t necessarily reshow the post to people who have already seen it, unless you’ve commented or shared. I could be wrong about that. Steven would likely know better. I must say there are always some tips that work for most of the population but some won’t. Your suggestions are quite influential and effective if used with proper focus and planning. Though I have seen people, who are helping others but still they are not able to get even 10,000 likes in the whole year. So I must say a person should follow all your tips not just stick with one. When I do everything to reach my goal, my journey accelerates. Thanks! Focused massive action is a great recipe for success. I think facebook has became one of the most important social media tools today, it has a very big impact on people, and to have a lot of fans on it is very good, thanks for the nice article. Steven, reading this article gave me inspiration to push ahead in my desires to be a successful author. It isn’t the money to make. It’s the people who connect with me because of my desire to reach out to them. Another reality I was confused from communicating people saying that Facebook changes; it “updates” a lot. Confusing to some. But, so do we change. If we didn’t, we’d be boring, unhappy, and negative. Maintaining a positive mental attitude to want to change is growth. Awesome tips! I noticed a complete change in my attitude when I started wanting to engage with the readers vs. thinking of money. Courtney, I think you hit the nail on the head. Attitude. That is where it all starts. I mean, I’ve gotta give Steven props for growing an FB page so successfully, but I can’t even imagine writing one of these “inspiring” quotes myself and then signing my name below it as if I’m really so important and I’ve just written some profound statement. I guess I can’t take myself that seriously. Woww. Really excellent case study and have given me many ideas. The step no. 1 exactly what I’m trying to build now because I believe to sell is but not selling. The framework has completed, just need time to execute the plan. Later, I will try the others 7 step. Thank you for the phenomenal wake-up call and for showing us that we can really help people with our work. Steve’s approach to this thread of comments demonstrates his absolute dedication to helping people, he must have a hell of a big heart and be excellent at managing his time. Thank you for putting this together Marsha, I really got a lot out of it and will be coming back often to monitor my progress. This content of this article is beautifully done. Engaging the audience seems to be more challenging then what it is. It’s really an amazing Case Study. Thanks for taking your time and writing this great post. I always try to take away at least one point when reading posts like this one (awesome) that have a list of actions to take. In this case, #4 is the winner. Write your own Aha quotes. I must say it makes more sense than putting butter on bread. I’m really satisfied with your points. This article looks clear and crisp to the point. I loved that video section. It is a myth that one could replace a great content with an interesting sauce in a video piece than the boring text. This case study will help me to grow my Facebook authority level I guess. Thanks for this content buddy. I really like your “touchy” part whereby we need to stir up the emotional string of the readers to incite comment! No doubt, engagement will increase fans, but is foremost important for the personal brand IMO.